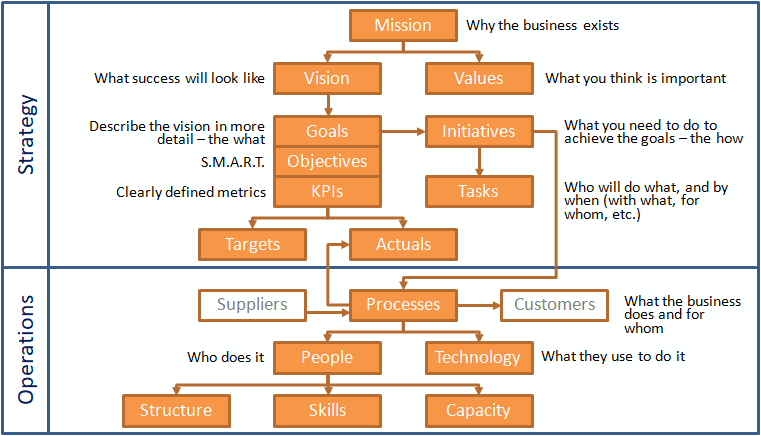 What are the key elements of a business strategy and how do they relate to each other? The above chart maps these out, including the key elements of operations which strategy must direct. Mission: defines why the organisation exists; its purpose. Values: are what the organisation holds dear; they are important in choosing what the organisation will and won't do, and how it will or won't do it, in order to achieve its mission. Goals: describe in more detail what the business must achieve in order to achieve its vision. Goals are often described as defining the financial, customer, operational and learning and innovation perspectives of the vision. See also: Strategic goals versus operational objectives. Objectives: break the goals down into specific, measurable, achievable, realistic and time-bound (SMART) achievements. KPIs: define the specific measurements with which the objectives will be measured. See also: Six tips on how to pick the best KPIs for your strategy and Getting the most out of KPIs. Targets: define what must be achieved, expressed in terms of a KPI, within a defined time period. Actuals: define what is actually achieved with a period for a measure; if this is inconsistent with a target, then review and remediation may be required. Initiatives: define specific changes to be made to the business, and should have a clearly defined end state. See also 6 techniques and 5 tips for developing strategic options and How to tune and prune your portfolio of strategic initiatives. Tasks or Actions: are the specific steps that need to be taken to achieve the end state defined for an initiative. They define exactly who needs to do what and by when and may also define what they need in order to do it, and who they are doing it for. Processes: what the business does on an ongoing basis to transform the input it receives from its suppliers into the output required by its customers. People: who perform the processes. Structure: how the people are organised to do so. Skills: knowledge, experience and capabilities that the people require in order to do so. Capacity: the number of people required to do it. Technology: the systems and equipment required to perform the processes. For more insight into strategic operations, see How to design a Target Operating Model (TOM). All of these components and the relationships between them can be defined in StratNavApp.com, the online collaborative platform for business strategy development and execution.